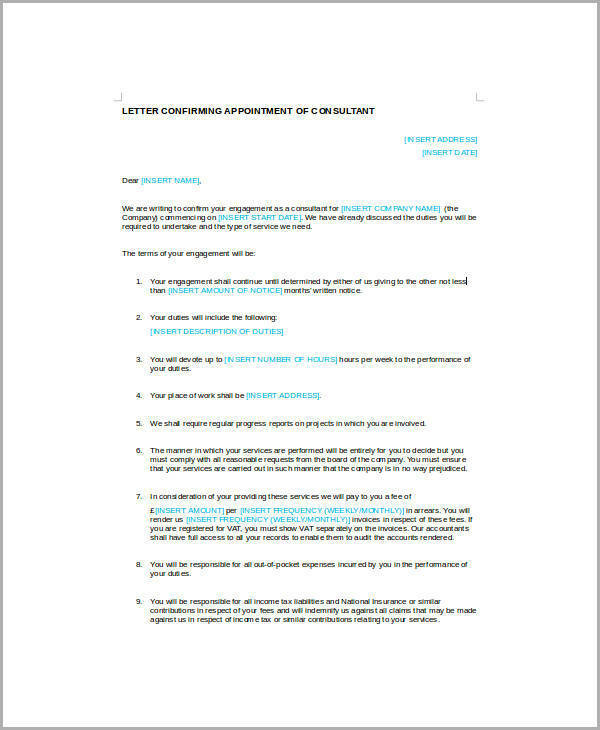 A business appointment letter, as its name suggests, is a letter that you can utilize to set up or reschedule business appointments such as proposal presentations, deal finalization, business meetings, etc. They serve as a great means of communication between business enterprises. 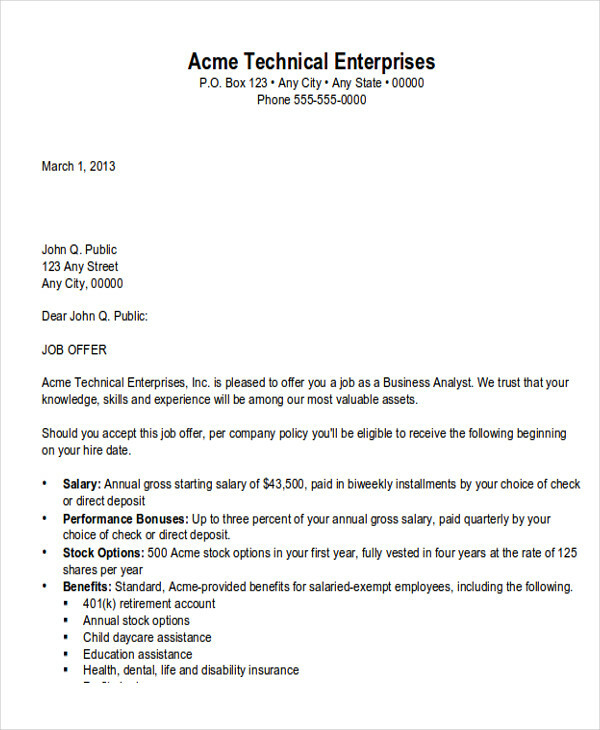 The eight Sample Letters that we have here for you will help you out when it comes to writing a good business letter. The samples we have are all free and are readily available for download. They are all downloadable in PDF and Word Document format that you can easily modify the current office applications available on your devices. See all of the samples we have below! In writing a business appointment letter, you have to ensure that you include basic information that is relevant to the appointment. 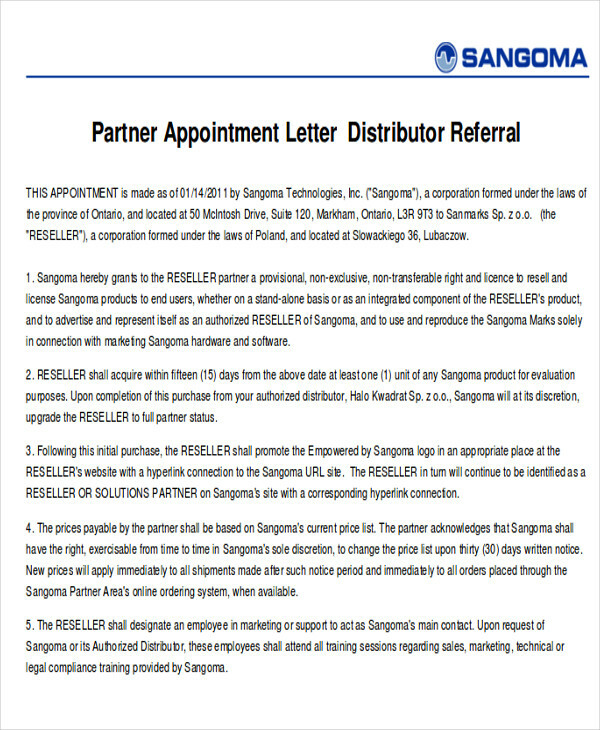 These letters are usually written when a company has decided to hire a new employee or promoted an employee to a higher position. It is a tool that can be used as a means of congratulating the employee about getting the new job. 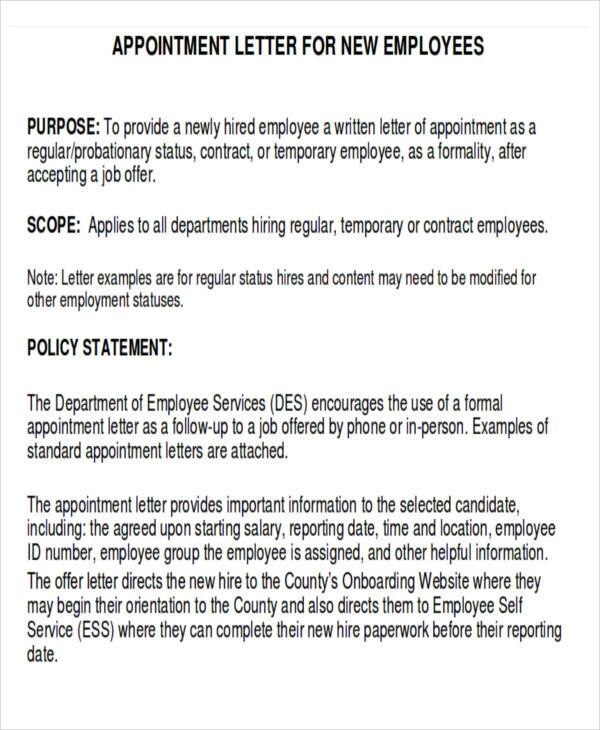 Here are some things to remember when you start drafting your very own business appointment letters. Make sure you provide the most basic information about the job such as the job title, start date salary package, and other benefits that may be deemed as vital for the position. Avoid any discussion that is associated with the contract. Discuss any requirement needed such as background checks, credit checks, medical checks, etc. Make sure that there are two copies available. This will serve as a legal binding between the employee and employer. One copy will be kept by the employee and the other one will be kept by the employer. Ensure that the necessary signatures are affixed in both copies. The legal team in the company can proofread and make any necessary corrections to your letter to ensure everything is covered. 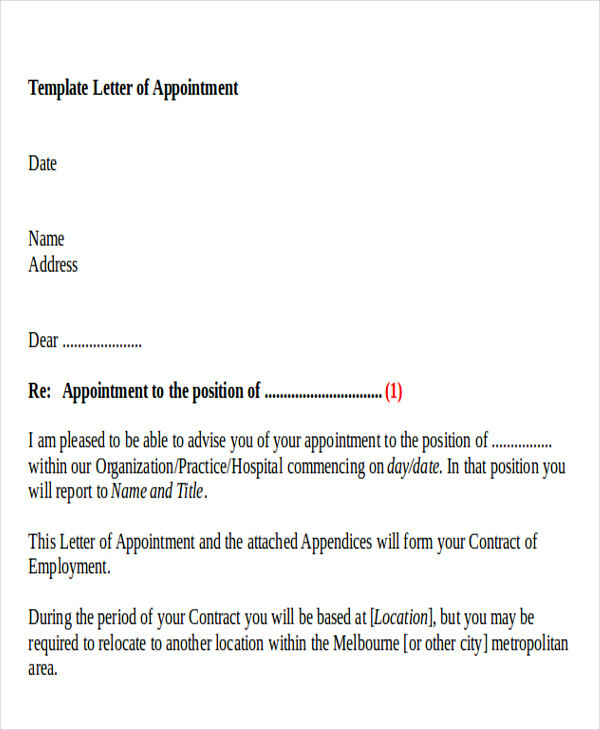 You can check out more appointment letter samples at Sample Appointment Letters. Formatting a letter properly helps to ensure that your message is easy to comprehend and that there would be lesser misunderstandings that may come up. 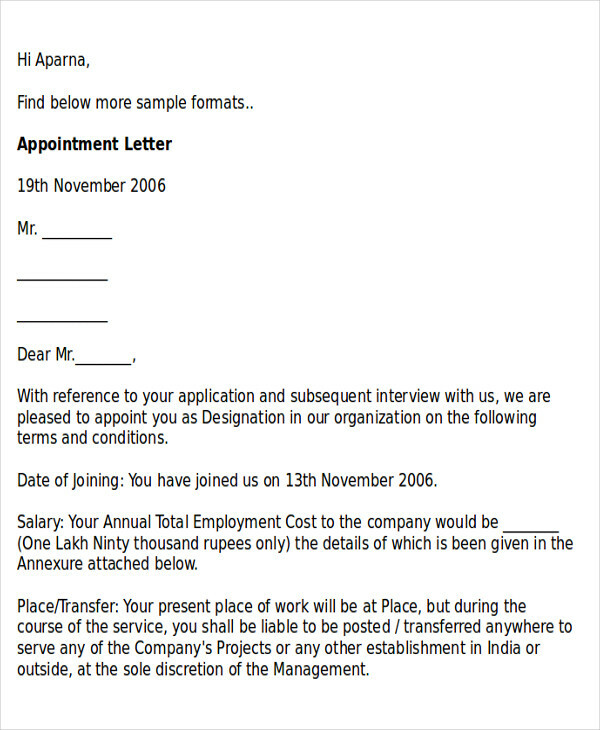 A business appointment letter should follow business letter format (see Sample Business Letters). The following details should be incorporated in your letter. Writing the date in your letter is extremely important especially if you want the recipient to respond in a timely manner. For the salutation, it is usually written as “Dear Mr./Ms. [Last Name].” You may use the recipient’s first name if and only if you know the individual well enough, unless you’re in the military where it is a necessity to use only the last name of the recipient. 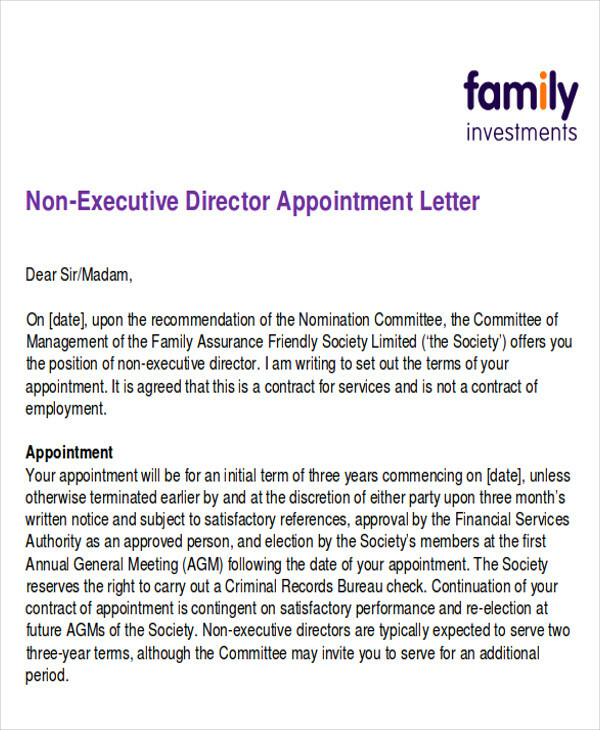 The body of your appointment letter may be composed of one to two paragraphs. You can enlist what you want to tell the recipient in bullet form to make it easier to read. Your closing paragraph should tell the recipient what is expected from them. Ensure that you offer to answer any further queries that they might have and leave your pertinent contact information. 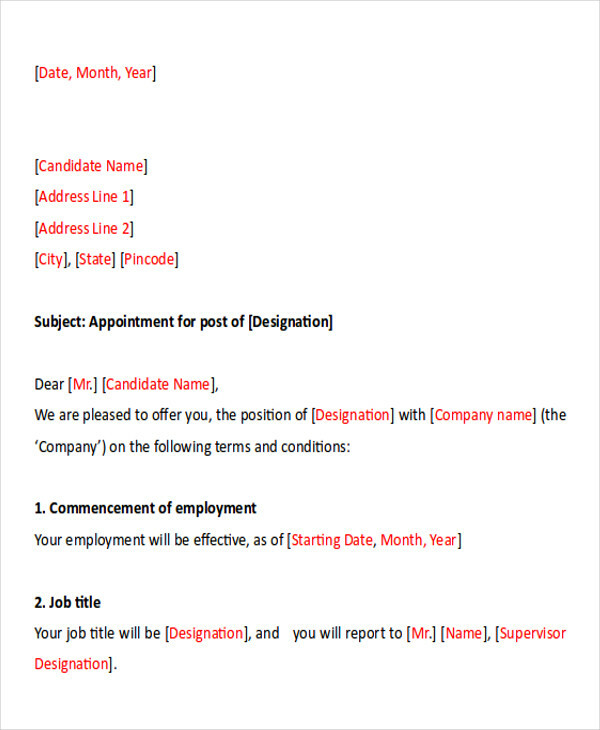 With the help of the sample letters that we have for you in this article, we are sure that you will be able to write your very own business appointment letters in no time.